Hi everyone! It's almost time for a new C.C. 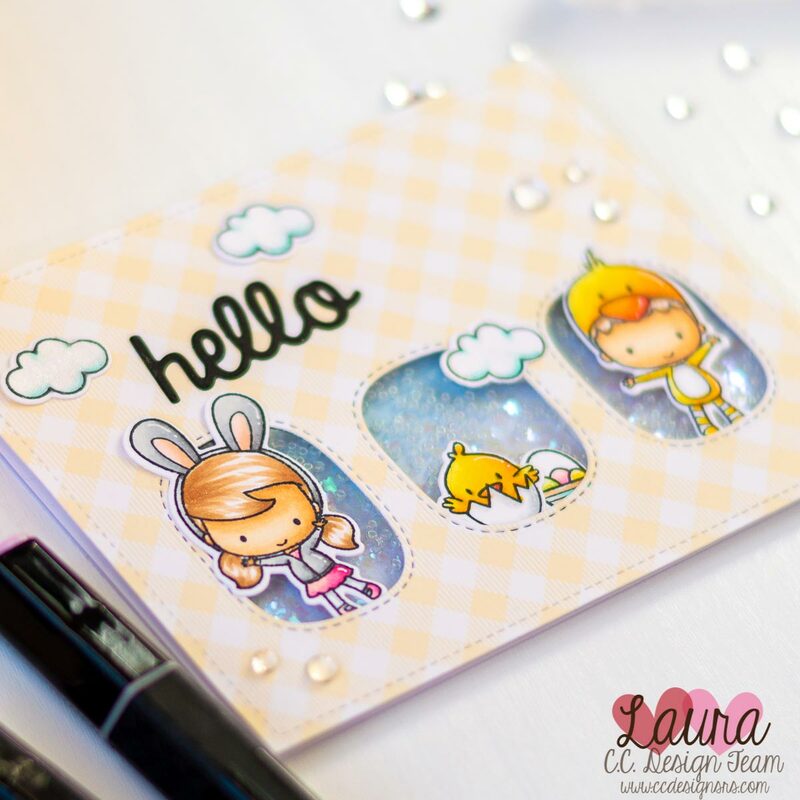 Designs release, and today we are showcasing the new, super cute Spring Things stamp set! This set is full of adorable images, and will be just perfect for spring and Easter themed cards! For today's inspiration I decided to create a simple triple shaker card with a light color palette. I started by stamping my images with My Favorite Things Black Licorice Hybrid Ink on Neenah Solar White 110lb cardstock. I colored them with Spectrum Noir and Copic Markers and die cut them with the coordinating dies. For the shaker front I started by die cutting one of the papers in the Lawn Fawn Gotta Have Gingham paper pad with the Lawn Fawn Large Stitched Rectangle Stackables dies. I then die cut three window on the bottom third panel with the My Favorite Things Stitched Triple Peek-a-Boo Window. I backed the shaker window with some clear acetate and used a double layer of Scotch 3M Foam Tape to create enough thickness for the shaker elements to move around. I filled each window with a mix of Studio Katia Clear Iridescent Seed Beads and Flowers Chunky Confetti Glitter, and closed the shaker with one of the papers in the Lawn Fawn Watercolor Wishes Paper Pad. For my sentiment I use the hello die in the C.C. Designs Quad Collage Fun Cutters and die cut some black cardstock. I glued all the elements on the card front and mounted it on a top-folding A2 card base. As a finishing touch I added some Studio Katia Drops from the Clear Round Drops Mix and the Clear Round Drops Mix 2. And that's it for today! 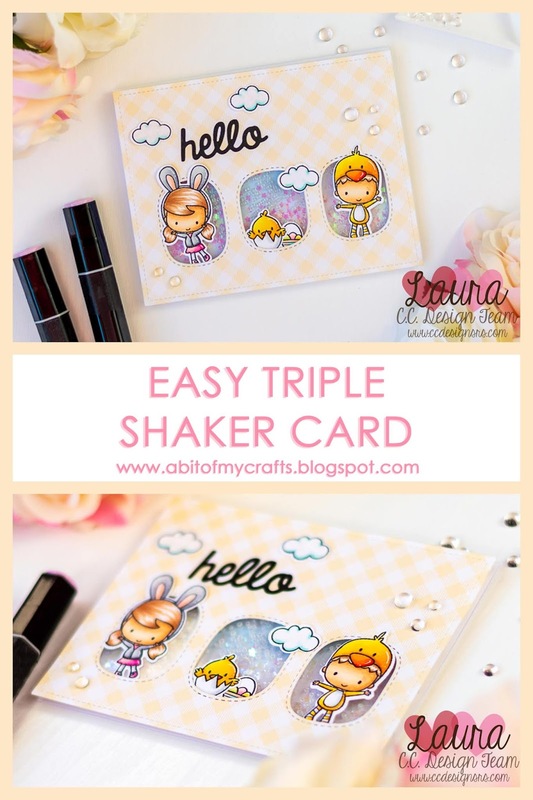 I really hope you enjoyed this cute spring triple shaker card with the C.C. Designs Spring Things stamp set! In case you didn't know, there is a blog hop going on, and you can enter to win the entire C.C. Designs release! What you need to do is comment on each DT member's post for release preview week, including this one, and then comment on this post on the C.C. Designs blog to let them know that you commented! Stay tuned for more fun projects, and have a great day! This is so cute! I love shakers! Oh my....these shakers are soooo cute. Lovely design and palette on this card with these costumed cuties. Super cute card! Love the new stamps and your pretty coloring! Cuteness overload!I love your coloring!!!!! Laura questa card e davvero adorabile e tu l'hai colorata in maniera impeccabile. Their little Easter outfits are so cute, love the triple shaker idea. Thank you for sharing & bringing spring into my rainy day.